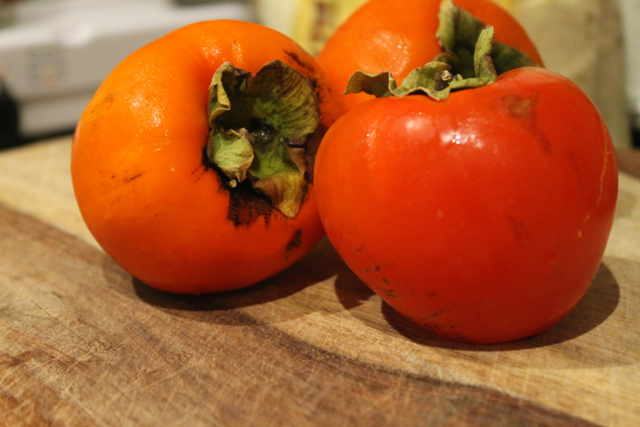 I have a confession to make—I’ve been scared of persimmons. Fear of the unknown, I guess, even though they are beautiful and plentiful here in California. When I saw that we had some growing on our tree this year, I figured I’m going to have to do something with them. Nothing would be worse than wasting these gorgeous, bright orange fruits. So I must admit, I’m pretty proud of this cake. Mainly because I took a recipe that didn’t have any persimmons in it and made it work. I’m excited to credit the excellent blog Mama’s Gotta Bake for the inspiration here. First of all, all of her recipes/creations make you want to lick your screen because of their obvious deliciousness. I’m so glad she lives an hour and a half away, because if I was anywhere near her house (not that I know where she lives, except in the Los Angeles area!) I’d keep stopping by and weigh about 300 pounds. Then you look at the photography—I swear this woman works for Martha Stewart Living magazine as a stylist and photographer. EVERY photo is amazing—both in composition and lighting. Clearly, there’s not one shred of jealousy in my body. Not one. Nope. BUT it’s lovely to have her as one of my blog friends, and she does continue to inspire me. 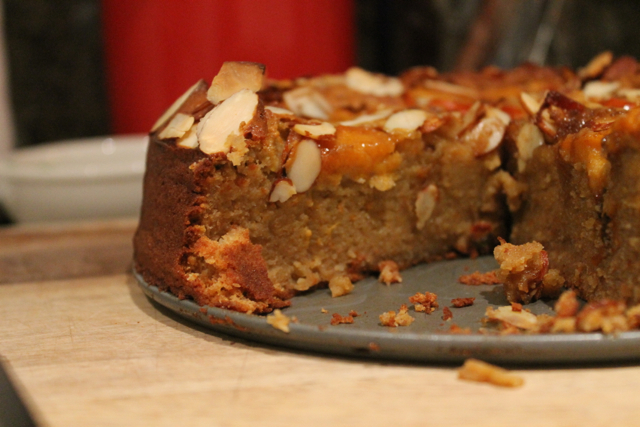 Most of her baked goodies are off my Paleo eating plan, but this almond cake she posted was right on target. Lots of eggs and no flour besides almond flour. For some reason, I thought I’d be able to substitute persimmons. There’s no rhyme or reason to why I thought so, except that pears and persimmons are in season at the same time. So I threw caution to the wind and tried it out. First I had to do all sorts of research on whether or not these persimmons that had gone soft and squishy during our second October heatwave (Fall? Autumn? Hi!! We’re over here! Don’t be shy!) that prohibited me from turning on the oven. Result! They hadn’t gone bad, they were perfect for adding to my cake. Then I had to make a few changes to the recipe. I used butter to grease my pan—sorry Mama, I just can’t bring myself to use PAM spray, ever. I also used butter and brown sugar instead of oil and honey for the topping, as The Husband is not a fan of honey. But otherwise, I followed Mama’s recipe, and while it baked in the oven (at 9pm, when it finally cooled off enough to turn the oven on! ), I fretted. It came out of the oven. It did smell like it turned out pretty well…. We let it cool (for only 15 minutes and nothing bad happened when I cut into it in half the time Mama recommended) and had a small slice—it was almost 10:30 by this time. And, oh my goodness, it tasted delicious. It tasted as if there was a hint of cinnamon in there, but there wasn’t. 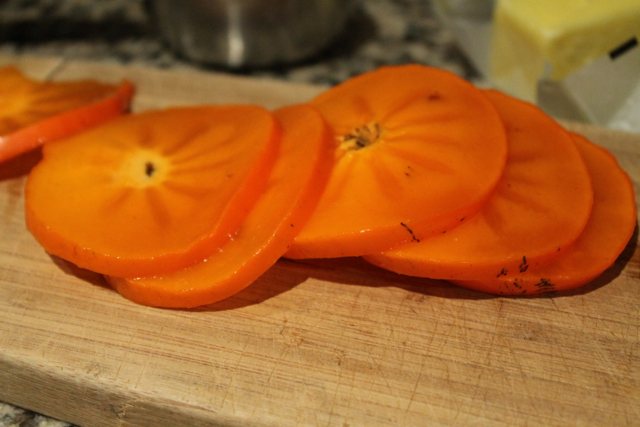 I guess that’s the persimmon flavor coming through, but it made me want to add some to the topping next time. If you want the recipe, head on over to Mama’s Gotta Bake, because if I post it here it’s just plagiarism, even with the substitutions. Besides, you know you want to see some of her other awe-inspiring baked goods, don’t you? Believe me, you do. You really, really do. Thanks, Judee! I wish I could send you a slice! Thanks so much! Let me know how it goes! Your blog is great–I like your variety of recipes and influence from around the world. Thanks for visiting! 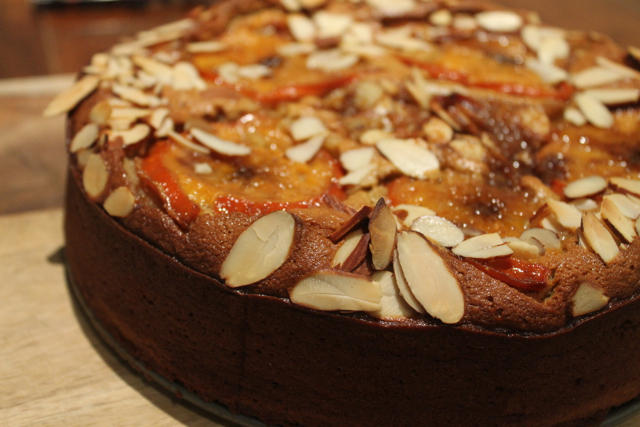 Well how awesome does that cake look, persimmons are a brilliant substitution! And thank you Jennifer for your sincere words, it’s blogging friends like you that keep ME inspired. It can be a cold and lonely cyber-world out there, but it’s people like you that bring so much warmth to it! Thank you so much! The feeling is mutual, for sure. And be honest—*did* you ever work for Martha Stewart? Your photography is just so stellar! Hello. Do you still have the recipe for this? Every time I try the link it says Mama’s blog cannot be found. Thanks! Let me know what you think if you make it. 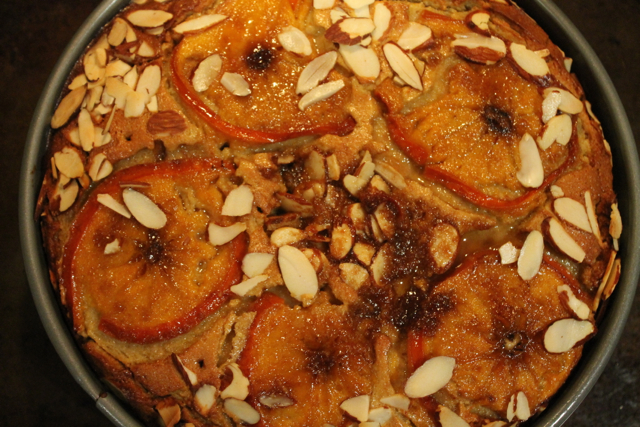 Will you make it with pears or persimmons?